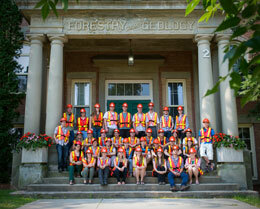 Students from European and Canadian universities are learning about New Brunswick forestry and environmental management through a specialized degree program offered by the University of New Brunswick. The Transatlantic Forestry Master dual degree program (TRANSFOR-M), which started in 2010, allows students to spend one year working on their degree in Canada and one year working on their degree at a European institution. Students in the program will earn both a Canadian and a European master’s degree in environmental management. UNB’s faculty of forestry and environmental management leads the Canadian initiative, partnered with the University of British Columbia and the University of Alberta. The European partner universities are: Albert-Ludwigs-Universität Freiburg in Germany, Bangor University in Wales, the University of Eastern Finland, and the Swedish University of Agricultural Sciences. The program is a follow-up to TRANSFOR, which saw 144 students complete an exchange at the undergraduate level. As part of the program, both the Canadian and European students will complete a fieldwork assignment, held in Canada this year. Students arrived at the University of British Columbia on Aug. 4, and then travelled to the University of Alberta. They will be in New Brunswick from Aug. 18 – 23. “I’m thrilled that students will get the chance to tour New Brunswick,” Professor Brigitte Leblon, TRANSFOR-M liaison officer at UNB said. “We will get to show them the unique facets of forestry and environmental management here as well as the various cultures of New Brunswick. ”While in New Brunswick, the students will learn about the forestry sector in the province, as well as about nature conservation in Fundy National Park.